What country music legend and host of the TV show Hee Haw died November 15, 2018? "I couldn’t justify turning down that big paycheck for just a few weeks' work twice a year. So, I kept whoring myself out to that cartoon donkey." Which (apparently unenthusiastic) co-host of Hee Haw wrote that in his autobiography? This leader of the Buckaroos helped to pioneer the Bakersfield sound. "Act Naturally" is among his 19 country #1 hits. The Beatles covered "Act Naturally," with Ringo on lead vocals, as the B-side for the September 1965 release of which single? A 2000 list by Rolling Stone ranked this ballad as the best pop song of the 20th century. CBS began airing Hee Haw a few weeks after the abrupt 1969 cancellation of what comedy duo's eponymous variety show? These performers sued for breach of contract, won their suit four years later, and made a brief TV comeback in 1975. The first episode of Hee Haw aired a week after the ABC premiere of a variety show hosted by which other country music legend? Bob Dylan and Joni Mitchell appeared on the first show, and recurring cast members included the Carter family (this man's in-laws). CBS canceled Hee Haw in 1971, part of Fred Silverman's "rural purge" of shows whose ratings weren't from the network's preferred demographic. Several months before the [rest of the] purge, Silverman had canceled which sit-com? Set at Shady Rest Inn and starring Bea Benaderet, this show went off the air in September 1970. Although Hee Haw would go on for 20 more years of independent syndication, the final network broadcast was on February 23rd, 1971, immediately before the "Mike's Hippie Friends Come to Visit" episode of which sit-com? Hee Haw thrived using the same syndication model followed shortly thereafter by what music and dance program? Created and originally hosted by Don Cornelius, this show aired from 1971 to 2006. 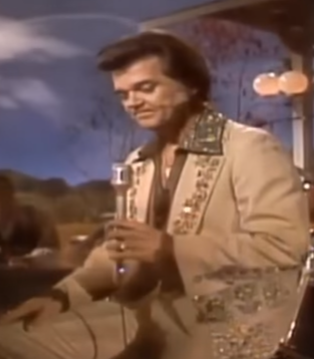 What country musician sang "Your Love Had Taken Me That High" on the 10th Anniversary Celebration episode of Hee Haw? You may know that performance from a Family Guy throwaway gag: "Ladies and gentlemen, Mr. [BLANK]." What actress (and former Miss Hawaiian Tropic) never appeared on Hee Haw but supposedly included a phony Hee Haw credit on her resume as of the early 1990s? Her daughter Tiffany now has nearly a million Instagram followers, and spoke on the second night of the 2016 Republican convention. The entertainer from question #1 died in which city, where he had lived since 1974? (An elementary school here was named after him in 1978.) This city is also home to the fictional Channel 62, as depicted in the movie UHF.